This year’s Library Student Advisory Committee (LSAC) consisted of 10 undergraduate and graduate students from a wide range of faculties. The group met four times, and engaged in in-depth discussions about their experiences with regard to UBC Library. In the first meeting, committee members were introduced to the activities and scope of the Library over the last year, including a quick summary of accomplishments made by last year’s LSAC (such as securing a Graduating Students Fund of $5,000 for the IKBLC Multimedia Rooms). In a group visioning exercise, the 2013/14 committee determined that it would focus on two key areas: branch and building hours, and study spaces. During the next three meetings, the committee shared its feedback in a variety of ways, including a two-part Design Thinking process. Elements included: the experience of graduate students looking for in-person Library resources and space during the summer; potential challenges with early branch closing hours on Friday evenings; suggestions for Library space renovations, including natural lighting and options to secure valuables; and possibilities for group and quiet study spaces. Each meeting featured a presentation about a particular element of the Library, which the students found particularly valuable in order to engage in informed discussion. Meeting minutes are available online. Hanna Murray, LSAC member and Faculty of Arts student, noted the range of services offered by Library branches. “Within UBC Library, students can access virtually every resource they need to succeed in their studies,” she says. “The Library relies on and listens to the voices of the UBC student community” in order to improve on services and spaces. Silvia Leung, also a Faculty of Arts student, agrees. “There is actually action and not just talk,” she says, reflecting on her term with LSAC. The Library Student Advisory Committee will reconvene with a new group of students in the fall. Thank you to all the committee members for your contributions over the past academic year! Buddha’s Birthday on May 6! April 30th, 2014 by phchow | Comments Off on Buddha’s Birthday on May 6! Posted in Displays | Comments Off on Buddha’s Birthday on May 6! Please monitor our Twitter and blog accounts for updates. Oliver Jones, Bennion on Statutory Interpretation, 6th ed. (London: LexisNexis, 2013). Barbara Billingsley, General Principles of Canadian Insurance Law, 2d ed. (Markham: LexisNexis, 2014). Joseph F. Kenkel, Impaired Driving in Canada: The Charter Cases, 2d ed. (Markham: LexisNexis Canada, 2014). Peter W. Hogg, Joanne E. Magee & Jinyan Li, Principles of Canadian Income Tax Law, 8th ed. (Toronto: Carswell, 2013). 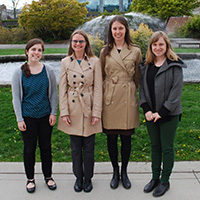 UBC Library employs a team of administrative professionals who provide valuable support to the organization’s various departments and initiatives. In celebration of Administrative Professionals Week, we highlight their diverse backgrounds, education and life experience. Tara Simonetta, the latest addition to the administrative support team, graduated from UBC with a BA in English Literature last spring, after having completed three co-op work terms with the Ministry of Transportation & Infrastructure, Vancouver Coastal Health and UBC Faculty of Arts. Tara loves keeping everyone organized, and, as a bibliophile, thrives at the Library. In her spare time, Tara enjoys bouldering, cooking, reading and travelling. Chrissy Johnson has a BA in International Development from Guelph and a Certificate in HR Management from BCIT. Another seasoned traveller, Chrissy has spent two years working and travelling in China, India, Southeast Asia, Australia and New Zealand. She enjoys all the wonderful people she has met and worked with at the Library. Her favourite thing to do off-hours is to explore new places – restaurants, cities, roads or parks. Anything different! Jennifer Martens has taught ESL in Canada, Japan and Mexico, and has a BA in History with an emphasis on Russian history. She also has her Library and Information Diploma and a TESL Certificate. Jennifer’s experience at UBC Library includes roles at the Education Library and in Technical Services, and she appreciates interacting with staff from all areas of the Library in her current position as receptionist for Library Administration. Outside of work, Jennifer loves to take photos of nature. Alicia Munro studied at UBC and has a BFA in Visual Art with a focus on painting. As a student, she worked for the Department of Art History, Visual Art and Theory. After graduation, she worked for UBC Staff Finders before applying for her position at the Library. Alicia enjoys the creative problem-solving aspect of her job, and finds it rewarding to work with staff from the Library and UBC Building Operations to resolve issues and contribute to improvements for Library spaces. In her spare time, Alicia can be found exploring the Greater Vancouver area on her bike. You are invited to celebrate Preservation Week with UBC Library as we feature blog posts from our community members highlighting personal archives and family histories. Do you have a special heritage object that you’d like to share with the UBC community? Perhaps a family heirloom with an interesting story or piece of memorabilia? The stories we tell are more than just personal histories; they are the histories of our community. Help us celebrate those memories worth saving by sharing yours. We will be posting all the stories we receive on Storify and Flickr throughout Preservation Week (April 27 to May 3). To participate, submit an image of your heritage object along with a story or description of the items. Please limit your story to approximately 300 words or less. You can tweet us, Facebook us, or even just make a comment on this post! Or to have your photo posted on our Flickr account, send us an image and a story to Library Communications by May 3. Be sure to tell us about your heritage objects, heirlooms, photos or memorabilia! Two of the top submissions will receive a $25 gift card to the UBC Bookstore.